What: Under the sponsorship of the Bryan Development Foundation (BDF), a Downtown Assessment Resource Team (D.A.R.T.) from Heritage Ohio traveled to Bryan and evaluated Bryan’s central business district. The assessment has been conducted and the D.A.R.T. team is ready to return and give a report on their findings. The report is designed to to gain a better understanding of Bryan’s downtown strengths and weaknesses, community wish list, assets and opportunities, as well as kicking off development of a vision, mission and long-range plan for Bryan’s central business district. Please attend the Heritage Ohio Downtown Assessment Resource Team (D.A.R.T.) 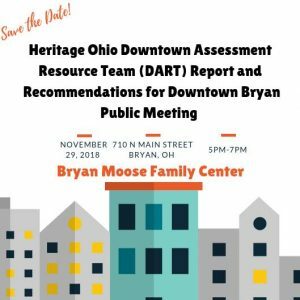 Report and Recommendations for Downtown Bryan Public Meeting. If anyone has a colleague, friend or neighbor interested in being a part of the future success and growth of the Bryan downtown business district and wishes to join please extend an invitation—the session is open to the public.